VATICAN CITY (CNS) — Love for God always translates into an active love of the poor, leading Christians to get up and go out to anyone in need, Pope Francis told members of the religious orders and charitable groups inspired by St. Vincent de Paul. “One who loves doesn’t sit in an armchair and watch, awaiting the coming of a better world, but gets up and goes with enthusiasm and simplicity,” the pope told more than 10,000 members of the “Vincentian family” Oct. 14. 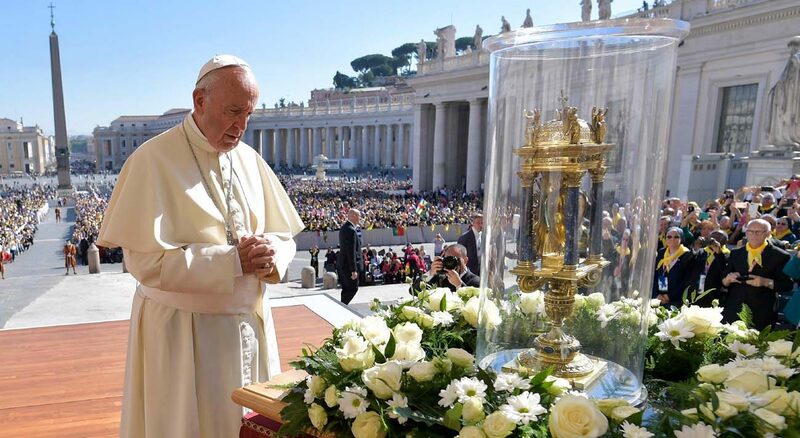 After making his way around St. Peter’s Square in the popemobile, Pope Francis paused on the stage to venerate a reliquary containing the heart of St. Vincent de Paul. The relic was a focal point of the international celebration Oct. 12-15 of the 400th anniversary of the founding of the Daughters of Charity of St. Vincent de Paul and later the men’s Congregation of the Mission. The Vincentian family also includes the Society of St. Vincent de Paul and other Catholic charities that draw inspiration from him. St. Vincent de Paul’s “passion for charity” has endured for four centuries because it is grounded in prayer and flows from adoration, Pope Francis told the crowd. Being aware that God awaits and welcomes each person, transforms hearts into those that welcome others and prompts them to set out in search of anyone in need.